In November of 1912, Theodore Roosevelt—author, police commissioner, Navy secretary, Rough Rider, governor, cattle rustler, vice president, president, big game hunter—suffered one of the most inglorious defeats of his life, either personal or professional, when he lost the three-way race between himself, William Howard Taft, and Woodrow Wilson. TR's attempt to establish a viable third party in the form of the Bull Moose (Progressive) Party had failed, the phone that so recently rang incessantly at Sagamore Hill was silent, and TR was in desperate need of distraction. 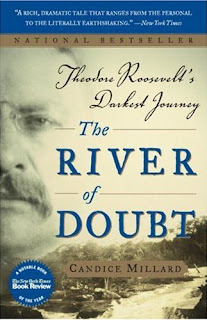 In The River of Doubt: Theodore Roosevelt's Darkest Journey historian Candice Millard recounts the the Brazilian adventure that would serve as just such a distraction. Invited on a speaking tour of South America in 1913, TR welcomed the opportunity to defend both the Roosevelt Corollary to the Monroe Doctrine and the Panama Canal. The trip would also allow him to pursue his childhood dream of field work as a naturalist, collecting samples for the the American Museum of Natural History, a New York institution found by his father. Accompanied by George Cheerie, the renowned scientist and South American explorer, TR planned to explore some of the best tread tributaries of the Amazon. All that would soon change though. Upon arrival in Brazil, TR was offered the services of Brazil's greatest explorer, Colonel Candido Mariano da Silva Rondon, as guide and tempted to jettison his staid itinerary for the chance to reconnoiter instead the unexplored River of Doubt, a thousand mile tributary deep in the heart of the Amazon rainforest. Accompanied by Cheerie, Rondon, his son Kermit, Brazilian doctor Cajazeira, and a massive company of Brazilian commaradas, Roosevelt accepted the challenge. The expedition was nearly doomed from the beginning. Prepared in the states by a failed arctic explorer and a priest with delusions of grandeur, they lacked proper provisions, canoes, or even a sense of the danger that awaited them. Pairing down the expedition time and again, exacting both equipment and people, TR finally set out on the river after more than 300 miles of overland travel only to discover a rainforest unwilling to supplement their meagre rations and filled with dangerous enemies from Stone Age Indians tribes to pirranha and Coral snakes to malaria and dyssentary. The rapids choked river nearly broke the company, taking the lives of two commaradas while witnessing the murder of another by a fellow commarada. Everyone, with the exception of the Brazilian commander Rondon, was laid low by the effort to survive. Unwilling to be treated with the deference due a former American president, TR worked right along side the Brazilians he came to respect (and no one worked harder than his son Kermit). TR nearly left his bones in the rainforest (a Roosevelt tradition of being buried where one dies) when he developed a severe infection after smashing his leg on a boulder in the river trying to save the canoes from being smashed instead. The infection, combined with malaria he had developed weeks earlier, led Roosevelt to contemplate suicide in order to allow the expedition to continue without the burden of bringing him out. Ultimately, as we know, Roosevelt survived to see his home on Oyster Bay once more. The Amazon, though, would claim his life. The infection he suffered returned, eventually leading to the president's death in 1919. Candice Millard treats this historic episode as it ought to be, as a page turning adventure. Her rearch is impeccable, making ample use of the diaries and post-expedition writings of the company to tell this compelling story. Though her focus is the Amazon adventure, Millard contextualizes the event with a succinct look at the four major players (TR, Kermit, Cheerie, and Rondon) before and after the fateful exploits on the River of Doubt. I can't wait to see what she tackles next.